At thirteen, Ava Hansen is mature beyond her years. Since her parents' divorce, she has been taking care of her emotionally unstable mother and her little brother--she pays the bills, does the laundry, and never complains because she loves her mama more than anyone. And while her father's new girlfriend is nice enough, Ava still holds out hope that her parents will get back together and that they'll be a family again. But only days after Victor and Grace get engaged, Kelli dies suddenly under mysterious circumstances--and soon, Grace and Ava discover that there was much more to Kelli's life than either ever knew. 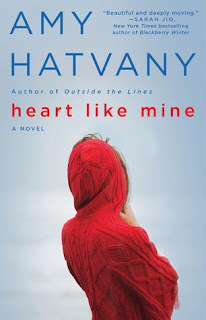 I will admit I have a bit of an author crush on Amy Hatvany. Her two most recent previous novels, Best Kept Secret and Outside the Lines were, for me, breathtakingly good. I've had my copy of Heart Like Mine sitting in my TBR pile since March, but only now had the chance to read it. Folks, I was not disappointed. Like her other novels, this isn't a cheery book. But, that's okay...it is a realistic story of a blended family in a time of crisis. I was a little worried about this book when I started--it could very easily have gone very, very wrong. It has 3 narrators and multiple-narrator books are sometimes problematic. Add to that the fact that one of the narrators, Kelli, is telling her store (in 3rd person, unlike the Ava and Grace) is a series of flashbacks. For a lesser writer, this could have ended up as an utter mess. Hatvany, on the other hand, is able to handle this tricky storytelling with ease. None of the characters in this book are perfect, but they are perfectly human. Grace is in a position she never wanted to be in and Ava has lost the person she loves most in the world--these are two characters going through very hard times. Yet, I never questioned any of their actions. Even Kelli, who could have very easily become the "crazy ex," is a character that the reader understands without any malice. My one complaint with this book is that I wished the character of Victor had been flushed out more. True, the book is essentially about Grace and Ava, but Victor is the glue and I would have like to have a bit more of him. I wouldn't say this is my favorite book by Amy Hatvany, but I'm so over the moon with Best Kept Secret and Outside the Lines (The Language of Sisters is waiting on my kindle! ), that I can still say that this is a book I would very highly recommend to anyone. I was not solicited for this review and I received no compensation. Ooooh... great review. I'll be adding this to my must read list. Thank you! Nice review! I'm glad you enjoyed the read! I'm a big fan of this author, too, and enjoyed this one. Thanks for sharing your thoughts.